Online gaming keeps growing in popularity among teens and young adults. 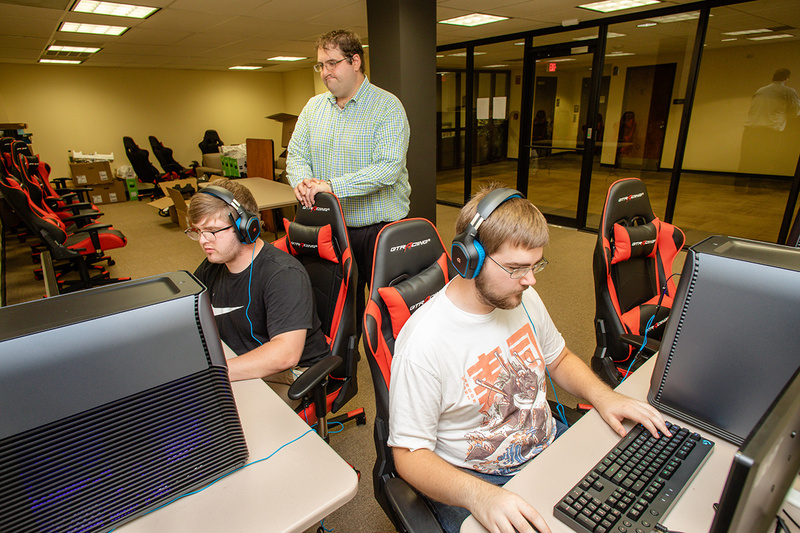 Henderson State University is tapping into this wave of interest with its own electronic gaming (esports) program, making Henderson the first college in Arkansas to establish an official team offering scholarships for competition. Esports primarily features organized, multiplayer video game competitions. The most popular genres are real-time strategy, first-person shooter, fighting, and multiplayer online battle arena games. An area on the second floor of the Garrison Center has been remodeled and will serve as Henderson’s esports room. It will include high-level computers, monitors, and other equipment used for competition. The room will also feature multiple televisions for console gaming, as well as additional seating for spectators and gamers. Use of the room and gaming equipment is not restricted to team members. Price said it will be open for all students to use at various times. “Open lab hours will allow any student to visit and use the computers and equipment,” he said. To be a team member, a student must meet a common set of academic standards to qualify for scholarships and competition, Price said. Team sizes range from 2-4 players to 5-8 depending on the game being played. An open meeting is scheduled Sept. 24 at 6 p.m. in the Garrison Center Cabe Room. Interested students can also contact price at esports@hsu.edu. Information will be available in the gaming room during open hours. Price said student interest sparked the idea for an esports program. Faculty from the Innovative Media department spoke to students who wanted to compete. Actual competition is similar to how anyone would compete in a sporting event during a typical season, Price said. “The difference being that teams do not normally travel for competition during the season, and only in special situations during postseason play,” Price said. Popular games include: League of Legends, Dota 2, Counter-Strike Global Offensive, Call of Duty, Heroes of the Storm, Overwatch and Starcraft II, among others. By 2019, it is estimated that 427 million people worldwide will be watching esports.